3-Pk. of .30 cal. Ammo Cans, rugged and protectively gasketed, PRICED RIGHT! American-made Ammo Cans modeled after the .30 caliber military version, ready to hold your brass and whatever else. And you get 3 of them at this low price. A gasket in the lid protects the contents from moisture. They have a cam-locking hinged lid and recessed carry handle that pops up as needed. Body is high-impact polypropylene, lid is strong ABS resin. Stackable. 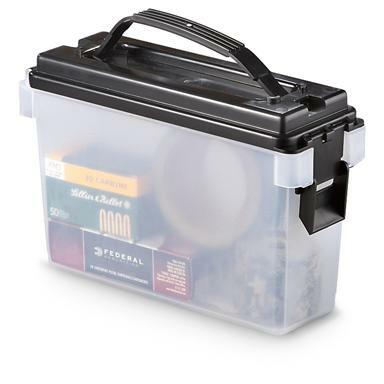 Interior dimensions are 3 1/4" x 9 5/8" x 6 1/4"h.
A terrific deal for shooter's storage... order now!